People with disabilities want new rules in place for scooters that block sidewalks. Scooters are gaining popularity nationwide, but some say these modes of transportation are hazardous for people with disabilities. 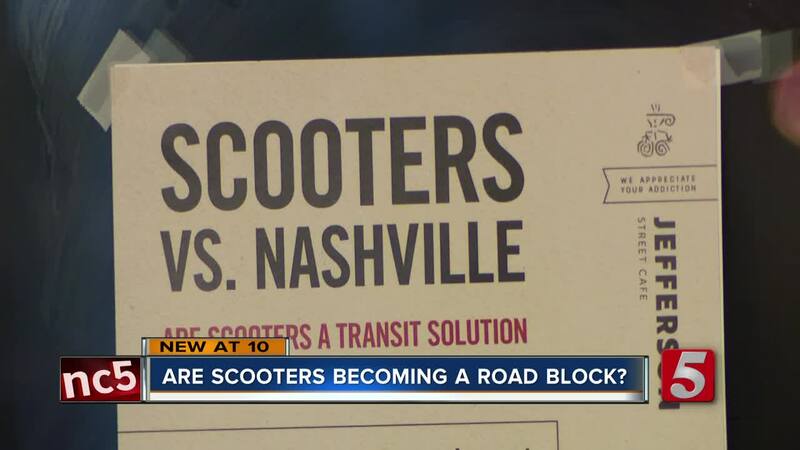 On Monday evening, many concerns about scooters were addressed at a meeting in Nashville. A panel comprised of a doctor, a council member and advocates for disability and race equality spoke to packed room. Their biggest issue that was addressed was enforcement. They talked about how the rules for scooters can be enforced by the companies. Another issue, was how can companies find a way to make sure scooters aren't blocking sidewalks. "This is a direct attack on my civil rights to be able to go to a coffee shop, to go to work, to come and go as I please," said Anjali Forber-Pratt. Forber-Pratt is a college professor, Paralympic athlete and a wheelchair user for almost 35 years. "I’ve shown up to try to get to work and not been able to enter my place of work because scooters have been blocking the only accessible entrance to the building where I work," said Forber-Pratt. Like many others in attendance at Monday's discussion, Forber-Pratt said she wants to see some changes. "I would love for there to be some sort of mechanism within the apps that identify the person who left that scooter in the way to be able to have some sort of fine, and a hefty fine for that person," she said. Big companies like Bird and Lime say they have rules on how the scooters should be parked. They also have app features providing instructions and how to report any issues. However, to some it's simple not enough. Tuesday evening Nashville Council members will vote on a legislation for docking stations for scooters - this would create designated parking for many scooters. If it passes it, will go in effect next year. We take the necessary measures to fix parking issues when they come up and encourage people to report issues they come across. Bird provides a number of ways for people to reach us including through the Community Mode in-app reporting feature, as well as by email ( Hello@bird.co ), through our in-app messaging feature, and by phone. Bird’s mission is to make cities and universities more livable by reducing car usage, traffic, and carbon emissions. Together, we have a responsibility to keep our neighborhood safe and clean, which means keeping our sidewalks clear. To help with this we’ve launched Community Mode, a simple in-app reporting feature that allows anyone to communicate instances where a Bird is hindering the movement of our community directly to Bird. Here’s [bird.co] the press release announcing Community Mode with additional details. We also have Bird Watchers, members of the local communities we operate in, to proactively address any issues related to the placement and parking of our vehicles. Bird Watchers monitor the communities daily and ensure Birds are parked appropriately. Bird investigates all reports of parking related incidents and takes appropriate measures, including suspending or removing people from our platform.